HF-315 Magnetic Loop Antenna from Caras Mfg. Discussion in 'Antennas, Feedlines, Towers & Rotors' started by KB4MNG, Jul 10, 2017. I have always been interested in loop antennas. I never got around to building one. I found this one other night on ebay so thought I would give it a try. I was surprised it would allow 25 watts-many loops are not rated for that. So, have you had any experience with similar loops. What kind of performance can I expect. I know it cannot compare to a dipole or most certainly a beam. I am just wondering, how good is a $ 99 loop, when most of the ones I see discussed are in the $300-500 range ??? AI3V, K3XR and WB5YUZ like this. Playing with loops for 12 months with a variety of good quality components but I cant figure out why that loop you have can tune across so many bands, there must be a secret component in the little tuning box. A big copper loop can easily cope with 100 watts as long as the capacitor has a wide enough air space or better still a variable vacuum capacitor. With no primary loop or gamma match or ferrite ring input I wonder if it is for receive only or QRP loop. 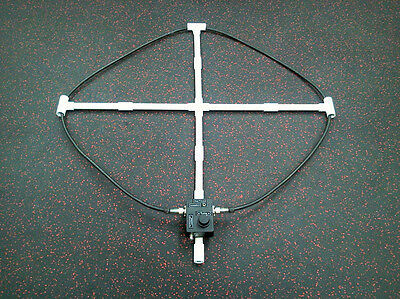 A good quality loop will outperform a dipole by far and will be close to beam performance if it is balanced correctly. I wonder what frequency that loop would tune to open ended on an MFJ with the capacitor removed as lower band circumference to frequency ratio is very large no matter how good the capacitor is. I will eat my hat if somebody can teach me the secret formula for a wide banded loop and I know there are many people on this site with a lot more experience than me on the subject. There's no free lunch in the antenna world. You can have efficiency, small size or bandwidth but not all three at once (pick only two). A good loop will cover an octave fairly efficiently (assuming all other parameters are close to optimum) but go beyond that and things begin to suffer in one regard or another. I dislike these commercial lightweight loops because their mediocre performance tends to give all STLs a bad reputation. They might suffice for the qrp/portable crowd (everything works) but if you want a seriously good antenna that is small and compact I think it is always better to "roll your own" so that the all-important construction methods can be adhered to. A continuous copper element joined only to a vacuum variable cap with sufficient voltage handling capability is not only the best way but the only way to go, in my opinion. Ideally, a monoband STL will give one the most bang for the buck as the size, O.D. and range of capacitance required can be optimized for that particular band. KX4O and M6LVC like this. Purchased one of these loop antennas recently. There was a summer deal and I decided to purchase it for $99. The air gap tuner is VERY sensitive, the RX signals are mediocre (they could be much better); the TX with a QRP station is difficult since the efficiency of this antenna is poor. One of the first problems I found is the radio BNC connector was loose (nut inside was loose) and the nut could not be tightened sufficiently. The solder for the tuner choke going to the BNC connector was cold soldered. I removed the BNC connector and installed a SO239 with 4 tiny bolts (much stronger mount). Another problem I found is that where the loop antenna PL259 connects to the coax there is signs of heat melting the shrink tubing (I am only running 5W from a FT817). With this... I have learned that if I want good performance... I need to do the research and use quality parts. Our own NH7RO has written many very good and useful articles about STL's ( magnetic loops you can actually transmit with) on this very forum. Very easy to find with a minimal search. I purchased one of the summer sale antenna's as well. I'm very happy with the assembled product. I was able to immediately receive on 80 meters (which is what I purchased the antenna for). I am also having issues tuning the antenna properly for transmitting - I have not made any QSO's yet with the antenna but I'm having fun experimenting. My biggest issue is that sometimes my automatic tuner can tune, but many times it cannot. I have to move the tuning dial on the antenna by micro-fractions to get the tuner happy. I'm sure as I use it more I'll get the hang of it. This seems like the kind of question to ask before you buy an antenna. The performance of a loop depends on its size, the total amount of resistance in the various components and connections, and the frequency where you operate it.